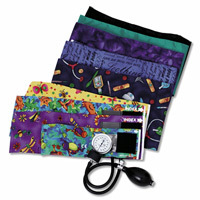 Durable nylon cuff with Index and range markings, gauge holder, and artery indicator label. Also includes a heavy duty vulcanized bladder, standard inflation bulb, and a precision calibrated manometer gauge. 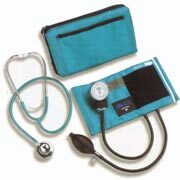 Arm Circumference 9 - 13"
Arm Circumference 13 - 17"
Dual Head Combination Kit.Nurse and students alike choose this combination kit for the reliability of the Match Mates Aneroid Sphygmomanometer and the flexibility of the Dual Head Stethoscope. This series features a durable cuff with hook and loop closure. The gauge is backed by a ten-year calibration warranty. 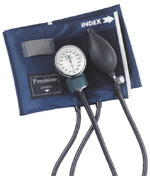 Precision Series Sphygmomanometers include a standard air release valve and zippered carrying case. It's no wonder that Precision sphygmomanometers are so popular! Available with a blue nylon. 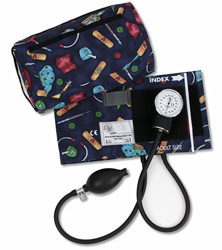 Featuring our most popular nylon aneroid, this set includes an extra large 6” x 10” matching colored nylon carrying case with an outer Velcro pocket, nylon handle, and zippered storage compartment. 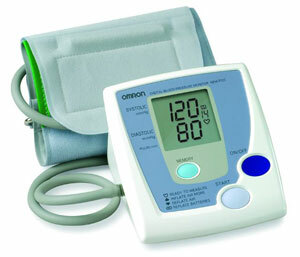 The most widely used stethoscope in the healthcare industry. Five stethoscopes-in-one design. Comes with a full accessory pouch with interchangeable parts to customize to the user’s needs. Features dual 22” PVC tubing for clear sound transmission and threaded soft eartips. The rugged chrome plated zinc alloy chestpiece and chrome plated brass binaurals are built to withstand the most demanding of working environments. One of the smallest handheld oximeters available, Datex-Ohmeda ’s TuffSat is the ideal spot-check solution for hospital, home care, transport, and EMS. TuffSat comes fully loaded with standard features.